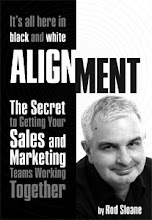 Sales and Marketing Alignment Blog from Rod Sloane: So What? Just been listening to Jeremy Nicholas on the radio talking about the "so what" test that journalists use to determine what is the story in the news. When journalists read a press release they ask themselves that question. "Bank opens new branch in Lincoln"...so what "New Bank Manager ran slowest ever time in London Marathon" now that's a story. how does that help your marketing? Well, it obviously is a little test for all your media releases. But it also helps with any marketing message you might have, any benefits you claim. I can build a web site in a week....so what? I can produce a set of financial accounts in three days....so what? I have a one page marketing plan template....so what? You have to work harder, think more and dig deeper to answer the so what question.